Four more books to get caught up on! 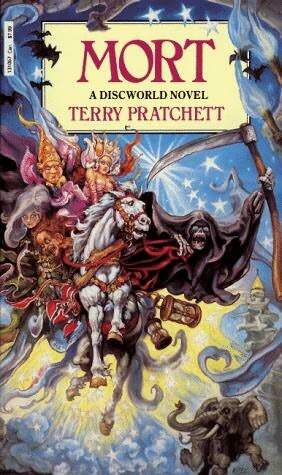 The fourth book in the Discworld series is about a gormless young would-be scholar (the cleverly named Mort) who, because he is made almost entirely of elbows and knees, can't seem to find an apprenticeship - except with DEATH. Hi jinx and kittens and myriad shades of black and the kitchens of greasy spoons ensue. This has all the elements of silly hilarity and somehow isn't hilarious. Pratchett, I just don't understand why your humour isn't working for me. I will keep trying. Another gormless protagonist, this time one who desires only to remain in his comfy house in the country and write a column about Nature. 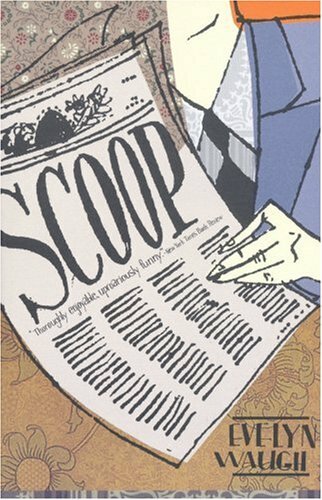 While not apprenticed to DEATH, William Boot does go through hell after mistakenly becoming the foreign correspondent for a dripping London tabloid. He is sent to Ishmaelia to cover the coup that is apparently about to begin. Hi jinx, attractive German women, portable Christmas dinners, and a great deal of casual racism ensue. Much better than Vile Bodies, which I loathed, and certainly well-written, but altogether not Wodehousian enough for me. 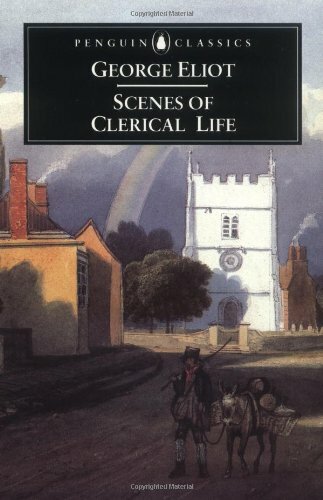 3) Scenes of Clerical Life, George Eliot. George Eliot's first book is not, I think, often taught in 19th-century lit classes or even in George Eliot seminars. It is not ranked up there with Middlemarch. In his introduction to the 1973 Penguin Classics edition of the book, David Lodge bloody well almost apologizes for its existence, beginning with this marketing fail: "Scenes of Clerical Life is not a title likely to set the pulse of a modern reader racing with anticipation" (p. 7). Well, dummy, you're not helping. And besides, why should increased heart-rate be part of the measure of a good book anyway? Damn your fashionable eyes, Lodge. Scenes of Clerical Life contains the important elements present in all of Eliot's brilliant work: primarily, excellent writing, and her unique combination of ruthlessness and almost infinite compassion when exposing her characters' flaws, weaknesses, and cruelties. This is not as good as Silas Marner or The Mill on the Floss, maybe, but it's all relative - it seems clear to me that George Eliot sprang out the God's forehead fully formed. 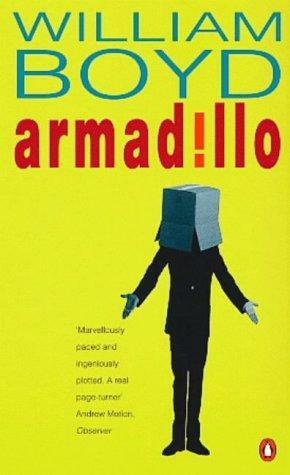 I really enjoyed Armadillo, even if it was maybe a bit pretentious and copped out with the whole "Oh, is this real, or is it a dream, WHAT THE HELL is it? non-ending" ending that is so annoying. But before said non-ending, the writing was very good, the scenes compelling, the characters convincing enough. Pinky rings, kilts, hairy bums, infidelity, 3,000 year-old masks, intrigue, unrequited love, and head wounds ensued. Most importantly, Boyd managed to make the ins and outs of the insurance business utterly fascinating. No matter what other faults this book might have, this alone makes it clear that the man is a genius. Looking forward to reading Restless at some point, which everyone (and by everyone I mean Ying) says is even better. So, now I'm all caught up, and I'm hoping (but not promising) that all the books I read from here on in will get posts of their very own. So, what do you think of Bookphilia's new look? It seemed overdue for a change. And I've been waiting a long time to use that illuminate MS. pic with the horse kicking the lion in the head. I like the look. What's the symbolism in the manuscript picture? Is there? I'm with you on Pratchett's humor, though it looks like you are giving him more of the college try. I like the new look, too; it's my first slapstick illuminated MS. And yes, my deteriorating eyes are grateful for no more white-on-black. And I'm so glad you enjoyed Armadillo. I agree that it came apart at the end - Flavia Whatever. Restless is much more tautly shaped. But as you say, the man is brilliant. I think there's something wrong with me. I so did not enjoy Middlemarch. I love classics, I love beautiful writing, plot, characters, lessons, social documentary through fiction...I'm not sure what was going on, but it bored me to tears. This, from a friend who gets ecstatic about Russian lit. Go figure. I'll take your word on it, though, and perhaps find the strength to pick up the one you write of here. Love the new look on your blog; loved the black background, too, but this is quite lovely. That picture is the greatest, and I like the new colors as well. I love the new look, too. Black backgrounds are hard for my aging eyes. Trapunto: I have no idea what this new illuminated pic is about; that's partly why I like it so much. Bellezza: I think a different George Eliot would be good for you - The Mill on the Floss? Or Silas Marner.